Its interesting to see that some of the art styles have evolved because of a need. 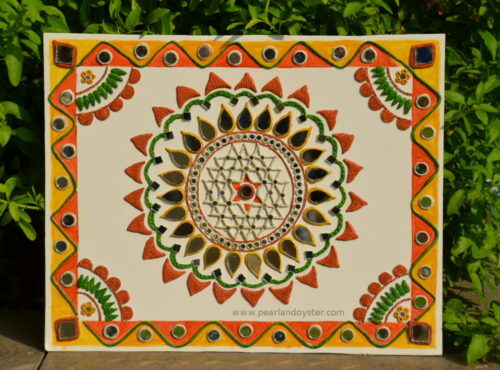 One such art is the Lippan Kaam, a traditional mural craft of the Kutch region. 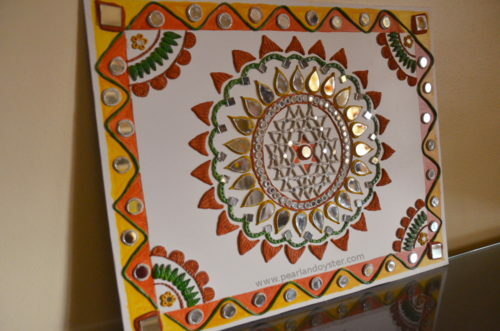 It is a simple mud and mirror work done on the inner and outer walls of a house. This is believed to keep the house cool during summer and a single lamp would be enough to light up the whole house. I was so impressed with this work that i designed a small patch for our house. As usual I added a flavour of the South and went with “Aishwaryam” kolam pattern in the center, which is a symbol to welcome Goddess Lakshmi. In this way I also make sure that even if the states in our country are not united, my artwork will have them bonded 🙂 This time, I was pleased to see the Gujarat float in the Republic day parade completely embellished with the Lippan work. As the saying goes “Kutch nahi dekha toh kucch Nahi dekha” …is so true!